Today is the 31st of October, Halloween. It not a huge thing here in Australia but slowly growing. Its the one holiday of the year I LOVE!! There is no buying presents for having to sit through boring family meals. You get to have fun dressing up and go out collecting lollies. 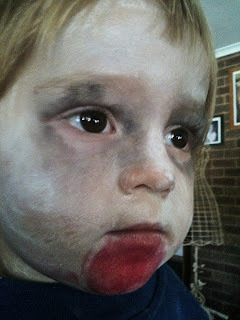 So I came home and made my youngest son into a zombie instead....and he LOVES it!